I forgot to mention this…. I posted some pics of the conference up on my flickr account. Check out Sasha – she looks great for someone who only rezzed 48 hours prior. 🙂 It helps to have experience in other virtual worlds. Honour was beautiful as always. Of course, who knew THEN that it was all the scripts in her hair that were causing lag…. 🙂 If she didn’t love scripts and scripting so much, I’m SURE this could have been avoided. And shared Arnold with us. Arnold is elegant AND extremely well behaved. Unlike my fowl….. Here is the lineup of events for the Beyond Blogging conference. All events will start at the Lotusphere Parcel on IBM 9. 13:00 PDT 16:00 EST Roundtable: What’s in a Name? 14:00 PDT 17:00 EST Roundtable: Appearance Matters! Virtual Worlds are more than just another medium for the exchange of information. Most of the venues we have for social interaction on the internet today, web pages, blogs, instant messaging, all revolve around the written word. 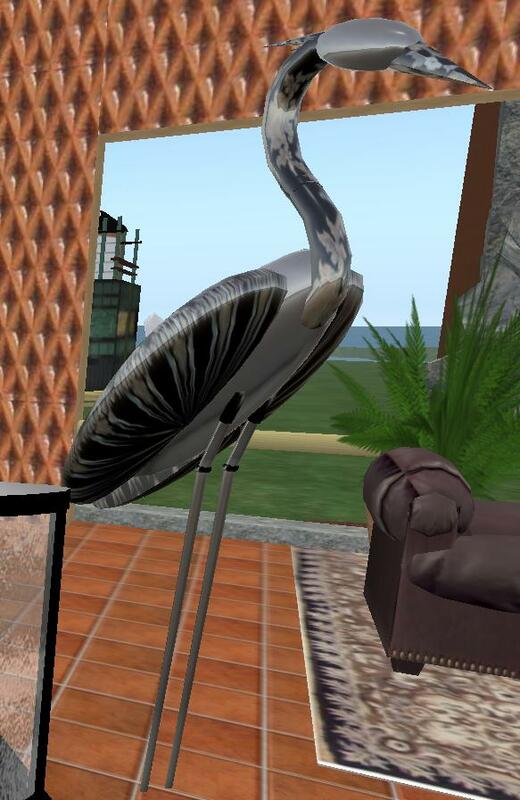 Virtual worlds such as Second Life allow for user contribute content that spurs on social interaction in ways that are quite different from previous text driven interfaces. 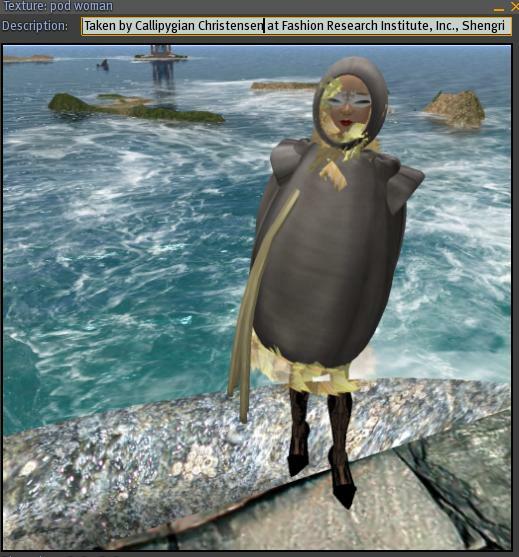 Jessica Qin will open the conference with a discussion of this culture arising from Virtual Worlds. Massively multiplayer online games, like any team environment, rely heavily on good communication and matched goals. Due to the lack of supervision by team leaders, organization and team identity are even more important. In teams who are geographically local, the team members can go to a dinner or some other event together. However, in a geographically dispersed team whose members are unlikely to ever meet face to face, these challenges have to be addressed differently. Sasha Oliver speaks on the lessons she has learned to address virtual teaming through her experience leading a guild in World of Warcraft. The ‘Beyond Blogging’ Conference is about exploring the use of virtual worlds by IBM and IBMers alike in their social and working lives. Virtual worlds are used for the expression of ideas, new concepts, collaboration, communication and community building. 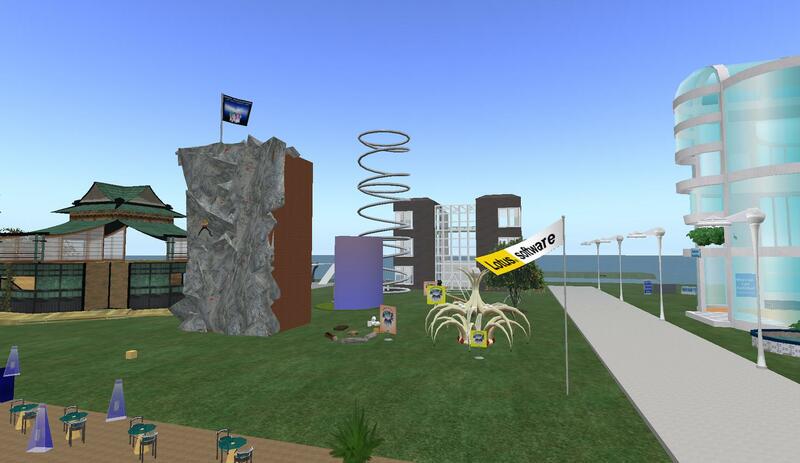 We are looking for papers, posters or presentation sessions along the lines of the conference theme: how virtual worlds have affected IBM and IBMers. Since the conference it taking place in public space, non-IBMers may participate if they wish. Those just wishing to attend may subscribe to the Developer Works Blog on “Return on Investment in Virtual Worlds” for updates. Those who wish to present a topic may do so. They just need an IBM Employee to “sponsor” them. You or your sponsor can contact the conference organizers for more details. Beyond Blogging will take place on April 7-8, 2009, on the Lotusphere parcel in the IBM 9 region of Second Life. Jaymin mentioned this conference to me a few weeks ago and then I saw that Tateru Nino was blogging on it as well. I’m providing a link to Jaymin’s website, but I have experienced some difficulties at times reaching it. So I will copy in much of the information here (*grin* the stuff that *I* find really really interesting). You KNOW that I am going to be therefor the Appearance Matters! session. Actually, I plan to be there for most of the sessions. 🙂 Because these are topics that I find fascinating. As you probably know, if you read this blog. I will probably have quite a bit to say in the What’s in a Name? session as well. *grin* Ah yes, topics that are near and dear to me. 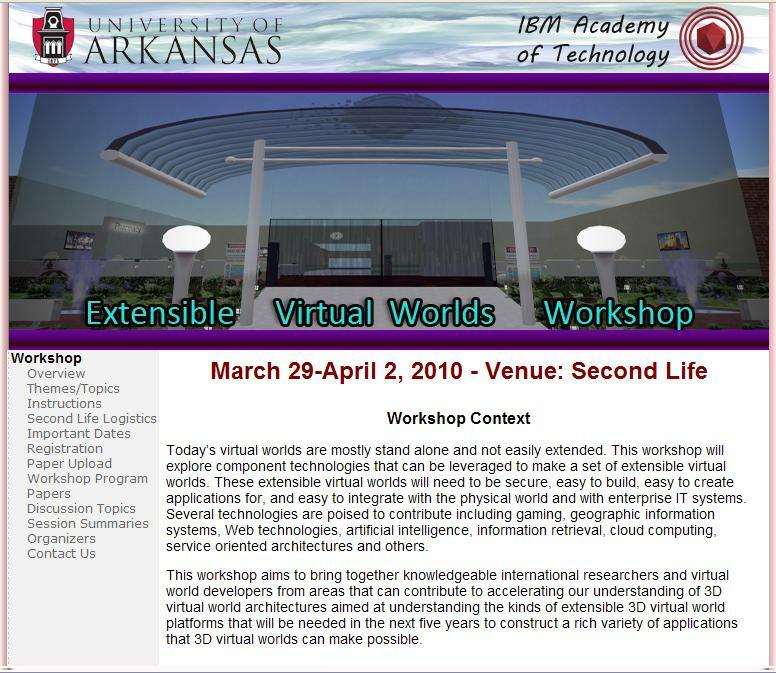 In late 2008 IBM’s Academy of Technology held a conference on virtual worlds in a virtual world: a private instance of Second Life behind IBM’s firewall. As an experiment in virtual conferencing for researchers of the topic it was a success and might have been relegated as an indication of where the future could go. However, six weeks later, the crashing economy and emergency cost saving measures caused the travel budget for the annual general meeting of IBM’s Academy of Technology to be cut. Suddenly our virtual conference work was pulled from the research sidelines and given center focus as it became the only possibly way to hold the AGM within the economic constraints. Neil Katz, an IBM Distinguished Engineer and chairman of the conference will speak on history, development, success, and ultimate lessons learned of the two conferences. And don’t miss “Leaving a Virtual Legacy”!!!! That session will be led by our beloved Honour McMillan. 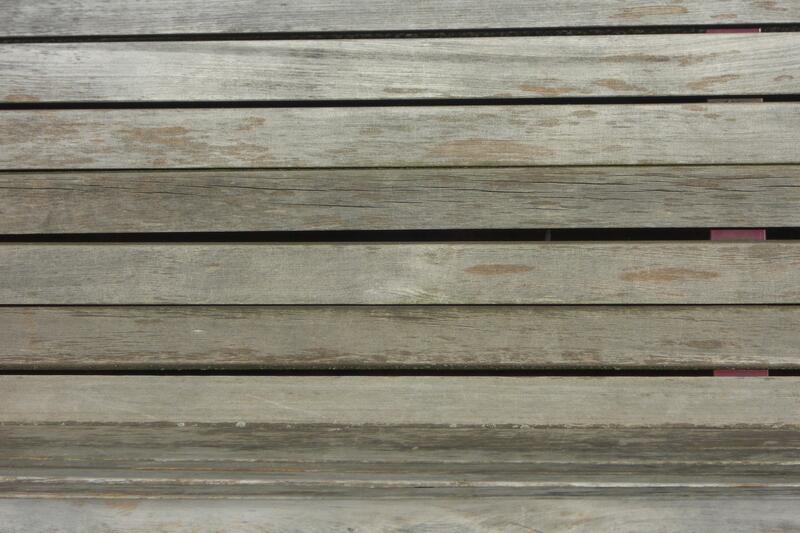 Nothing seems as ephemeral as the virtual world. What we perceive as land and buildings and accessories and appearances are just electrons, bits and bytes. Our concept of ownership is nebulous as they are stored on servers we have no control over, and do not represent something concrete we can hold in our hands. The general assumption is that our electronic creations are ‘writ on water’. And yet works of electronic media have been tenaciously persistent. What student of the late 80’s would have thought at the time their angst filled ramblings on usenet would be indexed and searchable 20 years later, prompting awkward questions from their children? Perhaps we should take our creations more seriously. It may be that our exploratory fumblings of today, of all the efforts of our lives, are the most likely to end up ‘writ on marble’; recorded, indexed, and presented is some unguessable 3D wikipedia of 2030. Finish up the first day with a social tour led by none other than Dale. *grin* Okay – if you know Dale (and if you read my blog you do), you know that this WILL be a fun. *grin* See you there! Get there EARLY!!!! IBM 9/Lotusphere has very good builds and games and is extremely interesting. 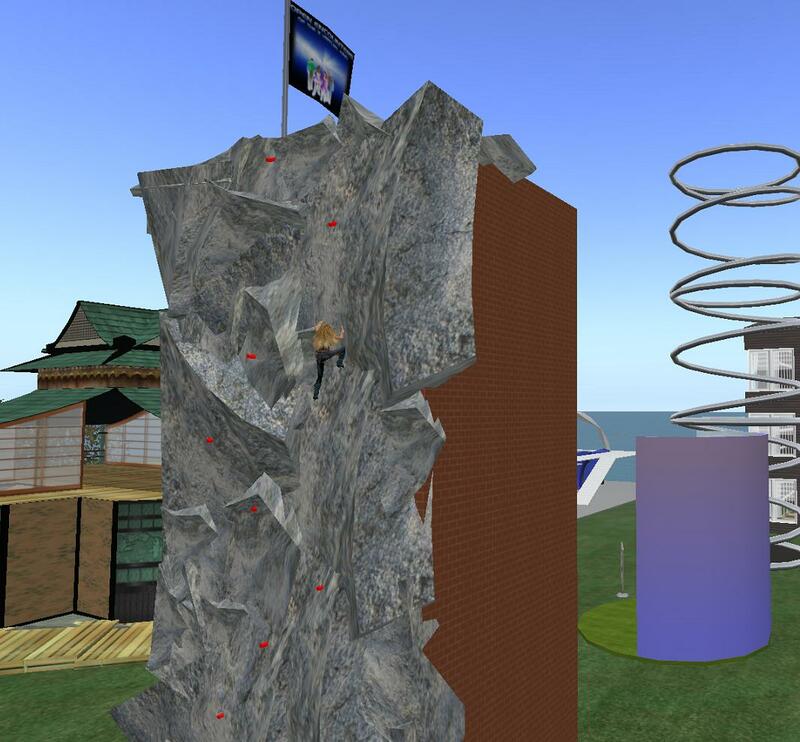 There is a climbing wall – check it out! To ascend the wall, you must answer the questions correctly! *grin* Look at me go!!! So Now What do I Do??? So the conference is over. The all-consuming all-out effort of preparing and attending – it’s done. Suddenly I have all this time. I don’t remember what I used to do. I feel somewhat bereft, to tell the truth. What do I do now that I am not searching the world high and low for trees? 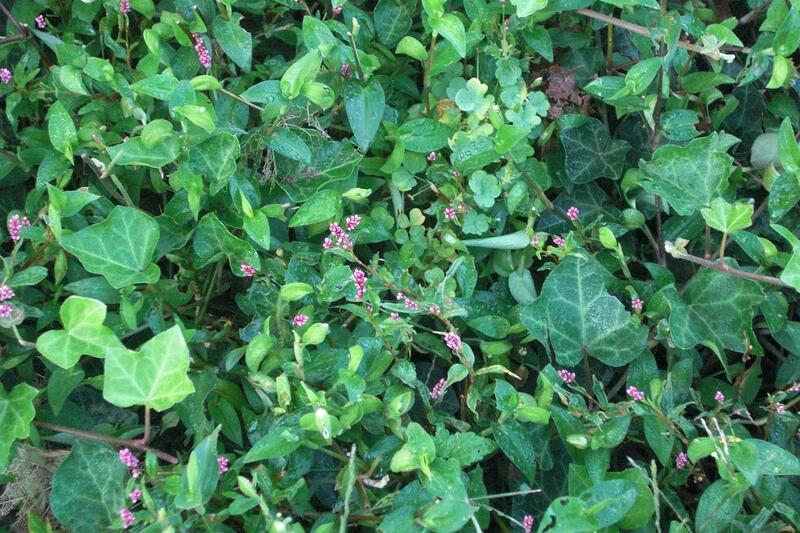 What do I do now that I am not endlessly planting. And ripping out my plants. Will I ever see my ducks again???? Looking on the bright side, however, I added several friends to my contacts list. I hope I get to see them again now that the conference is over. It will be fun to see other parts of the world and meet new people. And I have my first friends also. After the lingerie party I ended up back at Shengri La. Shenlei and Michele were modelling some beautiful new outfits available at the Vintage Marketplace. Then Calli tp’d in, fresh from the honor of being inducted into the SL Photography Hall of Fame! Way to go, Calli!!!! Shen modeled another outfit for us all. It really was simply beyond words. So I am relying on Calli’s photography to show you what I can not describe. 🙂 You have to click this to see it at full size. You must!!! So here I am. Another chapter finished, time to move on. Maybe I’ll even remember what it is to sleep. 🙂 Because it IS after 2am. Oh wait! Forget sleep…. I see a new friend has just logged on. /me waves – Hi T!